What motivates people to sail? After all, sailing involves considerably more than a trip to the store. You have to acquire and maintain the boat, and then, learn how to use it. It has no steering wheel or accelerator. And the sport must have more in it than putting on a picturesque show for others. Racing is about testing your knowledge and skills with others—to follow the rules, get to the starting line promptly, navigate the markers, and reach finish faster than the other guy. There must be something to this challenge and its reward. 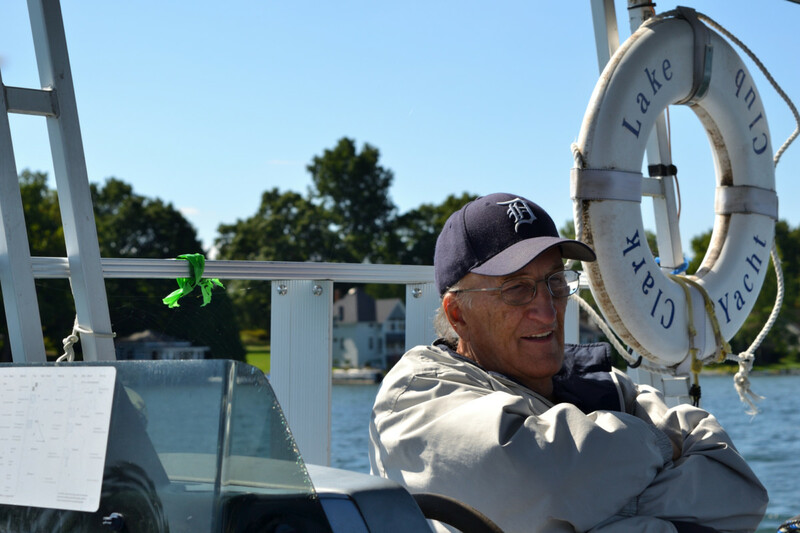 The members of the Clark Lake Yacht Club have maintained a sailing fleet for decades. They have moved their own mountains to achieve this. 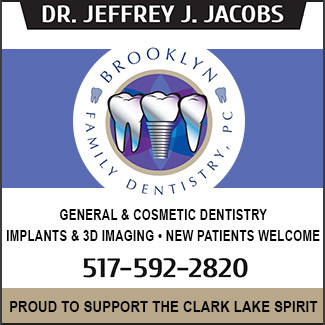 The Club has moved to several locations around the lake and gone through more than one metamorphosis through the years. Hugh Harris, a longtime member of the Yacht Club, took fragments of its history and pieced together this fascinating retrospective. 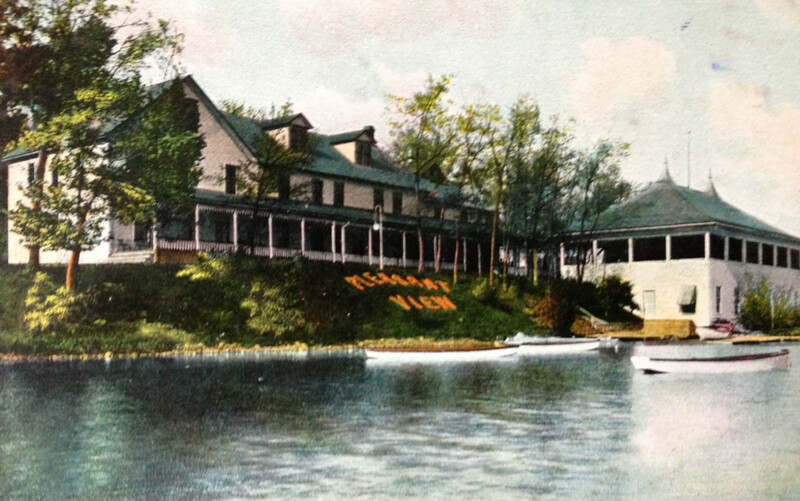 Royal Bengal Yacht Club is the name taken by the Clark Lake Yacht Club on its founding in 1931 in the basement of Pleasant View pavilion, later the Clark Lake Lodge. 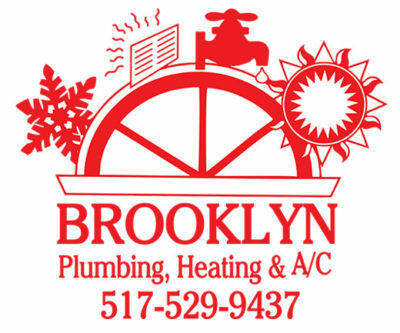 At that time, the basement was a bar and bowling alley under the ownership of Larry Miller, a supporter of the Club. 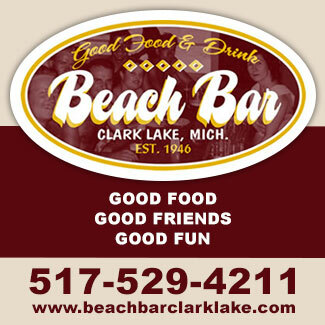 In 1933, the organization moved to Eagle Point, and changed its name to the present Clark Lake Yacht Club. The facilities were two lake cabins built in the early 1890’s, among the first on the lake. In those early days, boats ranged from 12 to 16 feet in length. Four classes were set up for racing purposes. Most popular among the boats was the Lark, a cat-rigged, jib headed scow about 15 to 16 feet long that raced in an almost one-design class of six or seven boats. 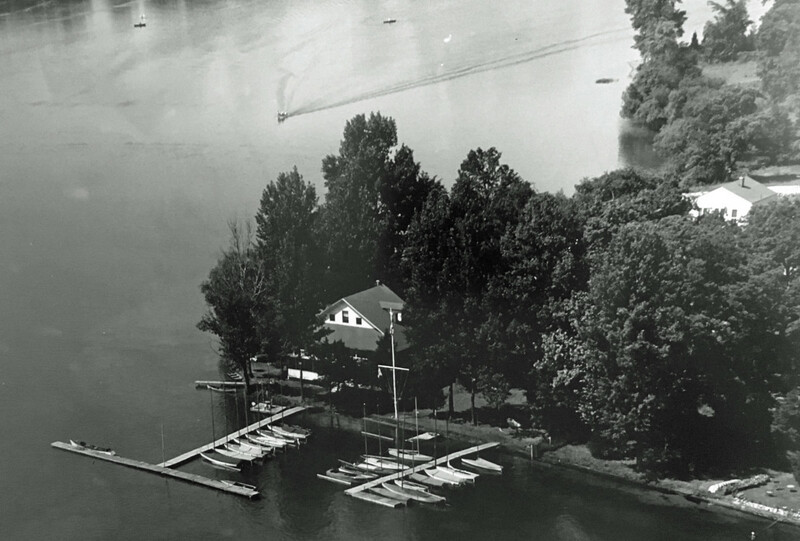 In 1939, the Club moved back across the lake to Kentucky Point, to the Graziana cottage, the same one that was floated down the lake on a barge many years later to become the Clark Lake Community Center. Once at Kentucky Point, Bud Kennedy purchased a Mower built by Chuck Burbach, of Burbach, Kestler in Fruitport, Michigan. Designed by Charles D. Mower in New York City, the boat was 18 feet, 9 inches in length, and carried 204 square feet of sail on its sloop rig. 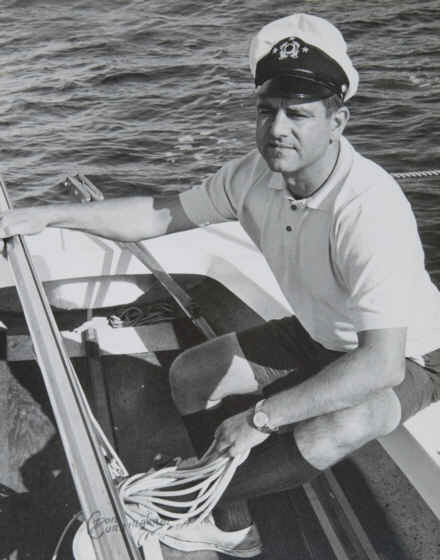 Kennedy’s boat was built of mahogany planking fastened on oak ribs with copper rivets and had a spar made of mahogany. Also in the same year another club member commissioned local boat builder Charles H. Wilson to build another. Wilson’s shop was on the second floor of a building at 217-21 N. Jackson, and next door to McConkey-Keehn Motor Co. Wendell McConkey, of the DeSoto-Plymouth dealership, was also a Club member, and former commodore. As construction proceeded, it was apparent that the boat would exceed cost estimates, and Clifford Sparks took over ownership. This boat was cedar planked on oak ribs with brass screws and a spruce spar. It comfortably held four persons and became popular. 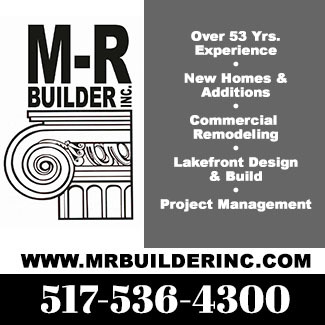 Having a local builder made it accessible, and each boat was built the same way with similar materials. Wilson eventually built 13 Mowers for Clark Lake sailors. Mowers were raced as one-design boats in 1938. It was typical for 10 to 12 of the boats to race on a weekend. With three or four persons in each, most of the Club members participated every weekend. In 1943, the Club moved to the Timberlake cottage, just west of the Pleasant View Hotel. But World War II made for big changes. The Club disbanded. Following the war, there was little competitive sailing on Clark Lake. Former members, instead, joined with Wolf Lake Snipe sailors or Lightning sailors at Devils Lake. Mowers sailors had drifted apart and weren’t interested in racing them. Although they had been a success, they weren’t the boats to reorganize around. They were awfully expensive boats to build. In 1950, former members became enthusiastic about the Rebel, an early fiberglass boat built in Toledo. It was the Rebel that would reinvigorate the competitive sailing spirit on Clark Lake. Six were purchased by the members in late 1949, and by 1950 the Clark Lake Yacht Club began racing again, this time from Eagle Point. The fleet grew rapidly with 10 to 12 boats over the next few years. A few other classes sailed with the fleet. A second class emerged in 1955-56. Bob Cornell was a Snipe sailor from Wolf Lake, but also was part of Clark Lake’s Rebel Fleet. He brought a fast new boat in from Toledo—the Interlake. Two fleet racing began. As the faster boat, Interlakes sailed first in races and became a successful competitive class. In 1957, the Club returned to Pleasant View for a three year stay. 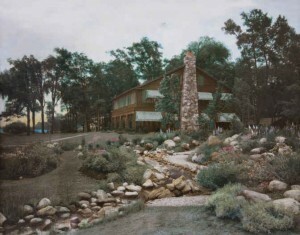 Desiring more spacious quarters and better grounds, the Club in 1960 purchased the Hayes summer home, its present location, from former member C.B. Hayes’ daughter. During the late 1970’s, Hobie racing exploded on Clark Lake. Fleet 58, which was not connected with the Club, was founded, and fittingly, sailed out of the basement of Clark Lake Lodge, the former Pleasant View. 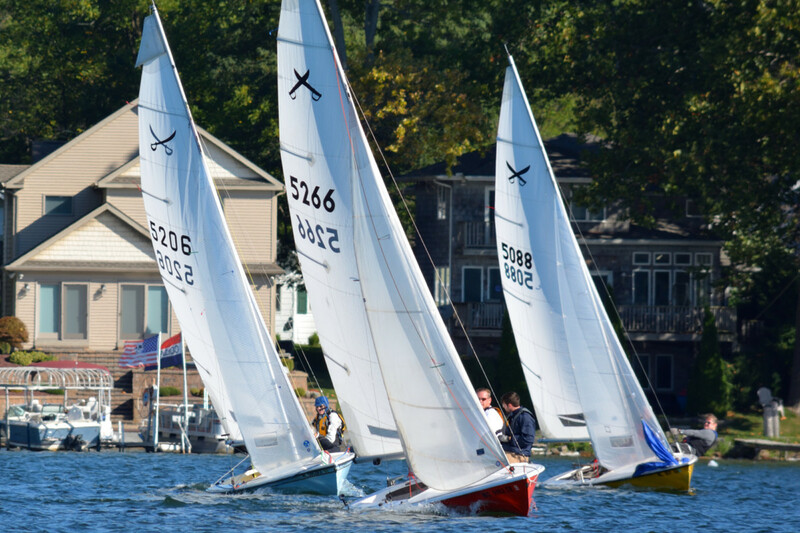 At one time, Fleet 58 counted more Hobies than any other inland lake in the United States. Hobies sailed Sunday mornings before Yacht Club races. During more recent years, other classes of boats formed fleets at Clark Lake. They included Lightnings, (which became inactive in 1978); Penguins, (prams that were purchased for a training program and intermittently raced); a so-called “Board Boat” group (consisting of Laser, Sunfish, Starwind and other small boat classes), Buccaneers (started by John Strawbridge in 1973 and active until recent years), and the Starcat 5.6 catamarans (started by George Carr as a fleet in 1980). In 1976, the company manufacturing Rebels, which had been purchased by a Chicago firm, languished. Although not directly connected with the Club, many of the sailors at Clark Lake Yacht Club formed Rebel Industries, and moved construction to Jackson, in order to ensure continuing production. The Rebel is currently manufactured by Nickels’ Boatworks in Fenton, Michigan. In 1994, the Sunfish sailors (with Reed Lowden as fleet captain) obtained a Sunfish International charter for Fleet 676 . The same year the fleet was awarded a regional regatta. The Sunfish Fleet grew rapidly. Along with the Rebels, it constituted the two main fleets in 1998. Also, interest in a Laser fleet was gaining ground. Sailing continued to be the focus through the 1980’s and 1990’s. In the new millennium, sailing remains central to the Club’s culture, even as powerboating and social aspects of the Club have become important. 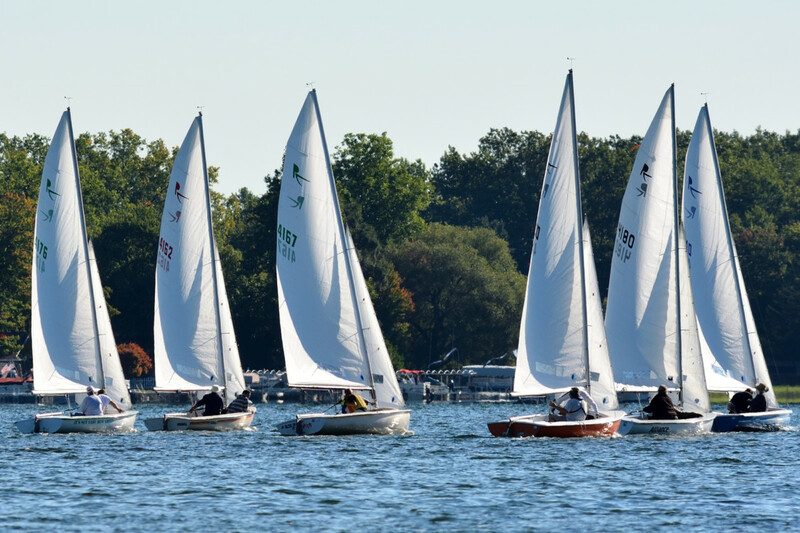 As of 2016, the Club continues to offer Learn-To-Sail classes and organized sailboat racing on Sunday afternoons. The present Yacht Club facility is among the finest of any inland lake sailing clubs. This praise comes from those who have sailed elsewhere, even in big boat sailing clubs. And how does the Yacht Club view the lake they sail on? Through the years the Club has expressed concern and took steps to care for the lake. 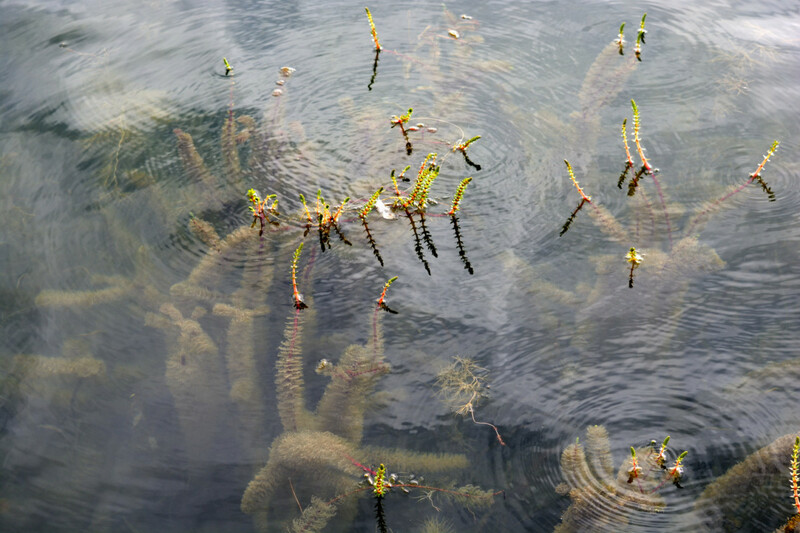 Most recently, the Club took an active role in the project to thwart an invasive weed—hybrid Eurasian water milfoil. This weed, unchecked, spreads wildly. In lakes that did not take action, recreational use was curtailed—swimming, boating and fishing. 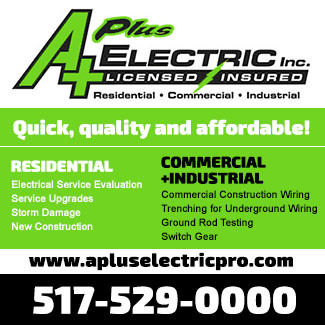 The weed also has destroyed natural habitat and adversely affected property values. Through the efforts of many at Clark Lake, including the Club, a program was put into place to treat this invasive species. Written evidence of the Club’s concern for the lake goes back as far as 1938. The Club formed a committee to monitor the lake and notify authorities of unlawful sewage dumping. They also worked to see that the lake was restocked with bass and blue gills through a state conservation department. In 1940 they formed a lake improvement committee. 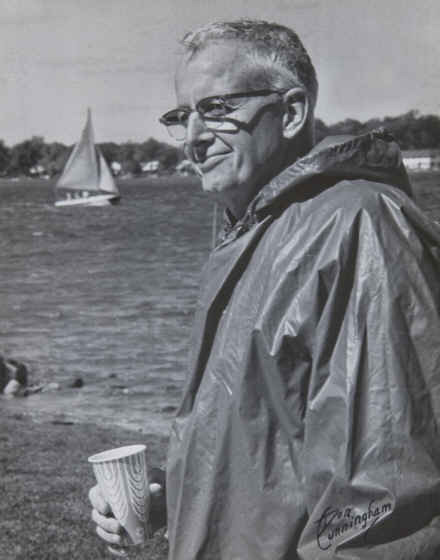 In 1968 and 1969 the Club directors registered concern about lake pollution. In some of these cases, there are no records of actions taken, and if taken, whether the action proved beneficial. 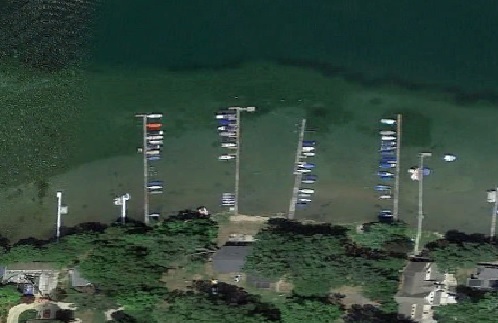 But these snippets demonstrate the Yacht Club’s care for the lake, something also expressed by today’s members. They share this concern with all who love Clark Lake. As noted in this history, the Club’s activities encompass a range of endeavors. What comes through all of it is the Yacht Club’s emphasis on sailing. The joy of filling your sails with a fresh breeze, skimming across the clear waters of Clark Lake, and using your skill toward a competitive objective cannot be underestimated. Is there a secret to be discovered in the world of sailing? 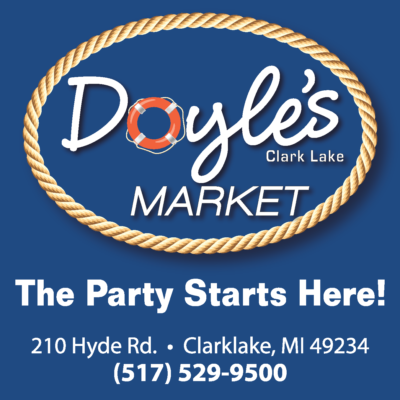 Members of the Clark Lake Yacht Club emphatically say “yes”!